The Woda Group Inc. works with local citizens to save a historic school and brings modern and affordable housing to the community of Nelsonville, OH. Westerville, OH, April 13, 2017…After a tireless, 16-year effort by a small group of dedicated residents in Nelsonville, OH, redevelopment of a historic school complex is poised to become a catalyst for economic revitalization in this small community located sixty miles southeast of Columbus. Construction at Nelsonville School Commons is one-third complete to adapt the historic Nelsonville High School Complex into 33 one- and two-bedroom modern and affordable apartment homes. The new development is the result of excellent collaboration between area nonprofits the Nelsonville High School Restoration Foundation and the Hocking Athens Perry Community Action Program; and The Woda Group, Inc, a leading affordable housing development, construction and management firm based here, with support from many others including the Athens County Commissioners. Nelsonville, surrounded by the Wayne National Forest, has a quaint downtown with 200 structures of historic interest including Stuart Opera House and the school complex, which is the largest structure in the historic district. In addition to the historic buildings, the community features many attractions for tourists, including a Hocking Valley scenic rail excursion line and several art galleries, shops and cafes. There are many other valuable services for local residents, and the community is home to Hocking College and only 13 miles from Ohio University in Athens. Outdoor footwear and apparel company Rocky Brands, based in Nelsonville, is one of the area’s largest local employers. Despite its strengths, Nelsonville has suffered financial decline over the years. Student housing demands have created a competitive rental market, often marked by above-average rents for substandard living spaces. “Employers told us they’ve struggled to bring new entry level talent due to a shortage of affordable workforce housing,” says Joseph M. McCabe, Vice President of Development with Woda and leader for the Nelsonville School Commons development. Nelsonville School Commons will offer a new high quality workforce housing option largely geared toward small families and other single-tenant residents that earn 60% of the area median income, says McCabe. The $9.6 million development is partly funded through highly competitive Ohio Historic Preservation Tax Credits administered by the Ohio Development Services Agency; Federal Historic Preservation Tax Incentives through the National Park Service; and competitive housing tax credits made available through the Ohio Housing Finance Agency (OHFA). The Ohio Capital Corporation for Housing (Columbus) serves as investor in the project, providing equity in exchange for tax credits. A bridge loan was made available through OHFA’s Home Development Loan Program. Construction and permanent financing was obtained through Summit Community Bank (Moorefield, West Virginia). “We are in dire need of financial revitalization and I think the school apartments will help our town,” says Dorothy Gettle who has lived in Nelsonville for her entire life and graduated from Nelsonville High School in 1957. The school complex (the last high school class to graduate was in 1967 and the complex was then used for many years as a middle school) had never been updated with modern amenities or standard accessibility features. After the school was closed in 1993, the building was then used as a gymnastics studio and for other various purposes but it had fallen into disrepair over the last 20 years. The oldest building at the site, built in 1907, was under threat of demolition when it was condemned by the city in 2015. McCabe was made aware of the school complex after a colleague noticed the historic buildings while passing through town. 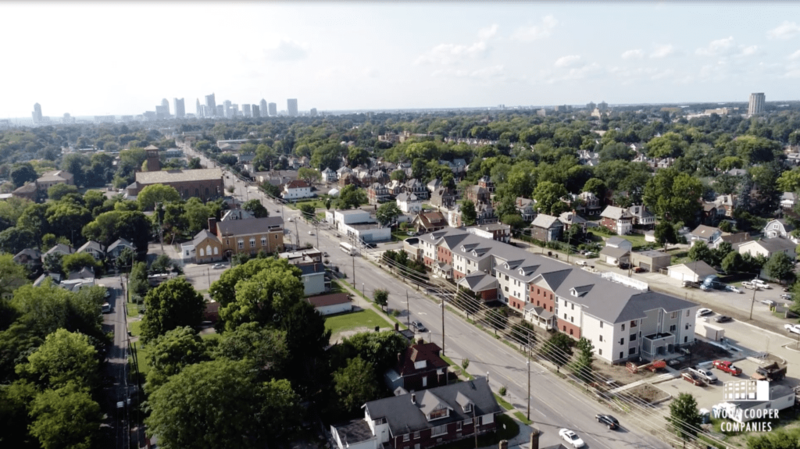 After several meetings, a Woda team, including engineers and historic architecture consultants, presented the foundation with a proposal for redeveloping the new affordable housing community. The building that once housed the Senior High was built in 1924 and is a good example of Classical Revival design. English immigrant William Mills, who became a prominent architect in the region after moving to Nelsonville in the early 20th Century, designed the building. The adjoining 1907 building was used most recently as the Junior High. It will be brought back to life and many of its charming architectural features including massive wood balustrade railings, two grand staircases and expansive feature windows, will be maintained. The Junior High is a rare surviving combination of Classical Revival and Germanic Rundbogenstil design, as evident in its blend of Classical motifs and its central arched brick tower and accents, says McCabe. The redevelopment combines historic charm with design for modern living. Some apartments will retain sections of decorative tin ceilings, original chalkboards, decorative millwork and built-in classroom closets. The original floors are being refinished where possible and new historically accurate windows will be installed throughout the building. New plumbing, electrical, and fire sprinkler systems will also be installed. The new apartments and common spaces will be consistent with universal design and built with utility-saving green architectural features, says McCabe. “The intergenerational design approach produces apartments that are trendy and appealing to younger individuals, while combining the best traditional time-tested elements that will appeal to seniors and elderly,” he says. Each unit will have individual heating and cooling equipment, and the open-plan kitchens will be designed for flexible use. In addition to the one and two-bedroom apartments, Woda is preserving and repurposing a large portion of the original auditorium seating area for a property management office, plus a fitness center and community room with kitchenette. There are also common restrooms and recycling facilities. The z-shaped connector building is being renovated and reconfigured to provide access between the two buildings with an elevator. Gettle says Nelsonville School Commons could be a means for attracting long-term residents who seek the quality of life and the pleasure of small town living. “We are trying to build our town back up so it is a nice atmosphere where people take pride in their homes and town,” Gettle says. The Woda Group, Inc. and its affiliates are experienced developers, general contractors, and property managers specializing in the design, construction, and management of affordable multi-family apartments, senior communities, and single-family homes. Considered leading experts in the affordable housing industry, the Woda team is known for producing and maintaining high quality affordable housing. Affordable Housing Finance Magazine ranked The Woda Group, Inc. 9th overall among Affordable Housing Developers and 22nd overall among Affordable Housing Owners in its April/May 2017 issue. The Woda Group, Inc. has developed and currently manages over 200 communities and over 10,000 units.